On sale now – or should that be on sail? If you’ve been thinking of pulling the trigger – or perhaps that should be firing the cannon – on purchasing Sea of Thieves, then this 50% off deal might tempt you into taking the plunge. Yes, the game is currently half-price for those who wish to buy it for the PC (Windows 10) or Xbox One, so instead of walking the plank and splashing out £49.99, you’ll only be down to the (accordion) tune of £24.99 in the UK. In the US, the game has been slashed with a cutlass from $59.99 down to $29.99. In Australia, the price has dropped from AU$99.95 to AU$49.97. The game is also getting a lot more attention from big-name streamers on the likes of Twitch these days, too, which certainly doesn’t hurt. Plus some exciting stuff is in the wings, like a new PvP mode – The Arena – which challenges players to collect the most treasure, and that should be out soon. Note that this deal runs until the end of January, so you’ve got just under a week to benefit from it. Deal expires: 23:59, January 31. 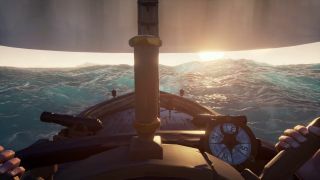 If you buy the game, be sure to check out all our Sea of Thieves tips and tricks.